COMPANY PROFILE Devon Energy Corp is engaged in the oil and gas sector. It is an independent energy company involved in the exploration, development and production of oil, natural gas and NGLs. Devon Energy, based in Oklahoma City, is one of the largest independent exploration & production companies in North America. The firm’s asset base includes 6.2 million net acres of conventional and unconventional oil and natural gas properties throughout the U.S. and Canada. At year-end 2015, Devon’s proved reserves totaled 11.2 Tcfe, with production of 4.1 Bcfe/d. Natural gas made up 39% of production and 47% of reserves. Midstream and marketing operations accounted for approximately 20% of company-wide EBITDA in 2015. 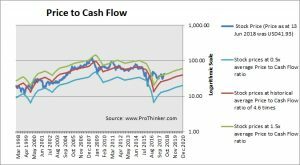 At the price of USD41.93 as at 13 Jun 2018, Devon Energy Corp is trading at a Price to Cash Flow Ratio of 7.1 times last 12 months cash flow. 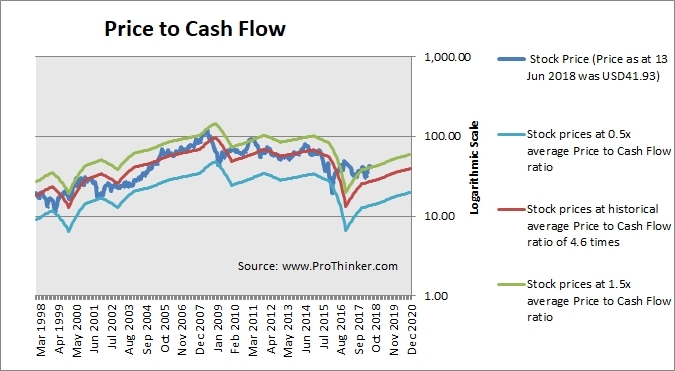 This is a 55.0% premium to its historical average Price to Cash Flow Ratio of 4.6 times.